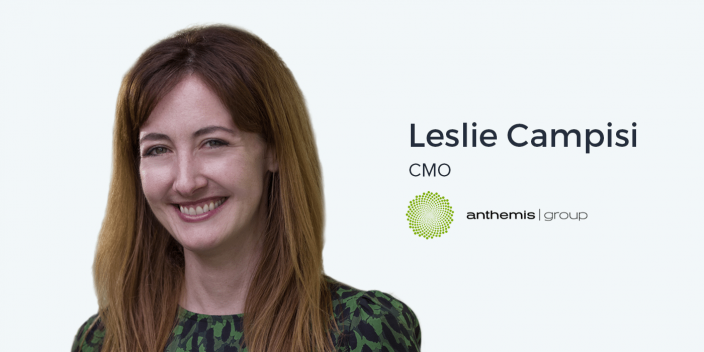 Leslie Campisi is the CMO at Anthemis Group, an early stage investment group, think tank, and consultancy for the financial services sector. Since 2010, Anthemis has developed a diverse portfolio of companies across a number of financial specific verticals, such as wealth and asset management, business and consumer banking, risk management, capital markets and trading, and payments. Betterment, Trov, Tide, and eShares are among their portfolio companies. Leslie has a wide range of marketing experience. After graduating from Loyola University with a double major in Literature and Philosophy, her enthusiasm for storytelling and internet theory led her to her first job in New York as a marketing generalist and coordinator in the heat of the .com boom. Leslie then spent eleven years running PR agencies, specifically, accounts focused on technology. She has been with Anthemis since March of 2016. The collaboration among competitors, from start-ups to Fortune 50 enterprise companies, can be very fierce. It doesn’t always have to be that way. In many cases, up and coming products don’t have to put the older ones out of business. If your product has a truly unique value proposition designed specifically for a highly targeted user base, you’ll attract customers uniquely suited to your product. Other companies have the opportunity to do the same. There might even be an opportunity for an integration, strategic partnership, or some other type of collaboration. It’s likely that there is space for everyone. Our work environment as marketers and advertisers is changing dramatically as artificial intelligence, automation, and other new technologies alter the way we perform of jobs. However, it’s possible that greatest change coming is the adjustment needed in organizational behaviors. As we move from the industrial age into the information age, our mindsets at work will have to shift. This is especially relevant if working on a new technology or introducing a new idea. As marketers and advertisers, we are conditioned to constantly monitor our quantitative KPIs and look for new metrics to drive our insights. It’s unquestionable that numerically defining the success of our marketing helps us make new decisions. However, it’s important to also think of attribution holistically. Attribution should also consider the untrackable behavior of visitors to your website and post-click landing pages. Even though it might not be quite as trackable, the hidden x-factor of positive PR or a celebrity endorsement can have significant value to your brand. As marketers, it is our job to responsibly convey the value that our products can bring to a specific audience. A large part of this job is engaging in values-driven marketing that reflects the values of a company. We are in a unique position as the storytellers of our brands that allows us to create the context in which our target users, and even our colleagues, understand the values of our products and companies. This is an awesome responsibility and brings new meaning to the work we do as marketers and how we help our brands break through the noise. Ander: Well, as I said in the introduction to this episode, I’ve come to New York for about a week, and I’m meeting with a bunch of really, really awesome marketers. And, I am sitting with one of them right now, Leslie Campisi, the CMO of Anthemis Group. Leslie, thank you so much for making the time to invite me into your office here. Leslie: Yeah, thanks for having me. Ander: And you used to work with our all-star marketing operations guy, Stefano Mazzalai, once upon a time. Leslie: Yes, indeed. He was actually my client when he was living here in New York. Yeah. He was working for a company in the gaming AdTech space. I guess it’s like three or four years ago? Five years ago? Not sure. He’s a great guy. Ander: Well, we absolutely love him at Instapage and to anyone listening, he is the #1 referrer of high-quality guests on this podcast so far. Leslie: That doesn’t surprise me! Ander: Haha. He’s quite the networker. Anyway, Leslie, a pleasure to be here with you today. I think that the best way to get started – and I said a little bit about this in the intro but it’s going to sound much better coming from you – is hearing your story, the sixty-second nutshell of your professional journey to where you are now. Ander: Haha. Were you actually? Leslie: Well, not on the farm, but yeah, I grew up in south Louisiana. Leslie: And I never, I guess, I never imagined that I would be a marketer, but I loved stories. So when I was studying, I did my undergrad at Loyola University in New Orleans and studied Literature and Philosophy. Studies of post-structuralism and internet theory and identity theory actually turned me on to the tech sector, and I started to become really fascinated by a lot of the experimentation that was happening in tech. Leslie: Well, if you’re, like, a story-telling, narrative geek like I am, these are the early days – dare I admit it – of hypertext. Ander: The grammatron! That’s awesome. Leslie: Haha. And it all seemed to be happening in New York, and I’d always wanted to live in New York, and I thought, ‘Well, you know, I could keep studying this or I could go get a job at a start-up and live in the city that I want to live in.’ So I actually came up to New York during my spring break senior year, interviewed at every dot.com that I could find, and I ended up getting a job as a marketing coordinator before I graduated. Leslie: And I moved up. That was, you know, the summer of ’99, so, like, peak dot.com craziness. And I was almost hired by the sales organization of the same company. It just sort of happened that the marketing team picked me up. I knew absolutely nothing. Haha. But I was fascinated by marketing and tech, and I really just kept sticking around. I always love to tell this story when I’m hanging out with millennials that work with me or work for me. In the first six years of my career, I had six different jobs because I’d get bored really fast. I’d feel like I learned something, and I’d want to be on to the next thing, and I think that that really helped me because I got to try out a lot of different sides of the marketing equation. Leslie: What could be cooler than that? But if the people you’re working with are jerks, it really doesn’t matter. And it was around this time that I ended up meeting a woman who really became a mentor for me at this point in my career, and she was starting a PR agency focused on serving technology companies. Leslie: And I really liked her, but I thought, ‘I don’t do PR. I’m not a PR lady.’ And she had a real vision for how the entire PR agency landscape was changing. She said, ‘Look, it doesn’t matter. You have this amazing interactive, social network, community-building, marketing skill set. Come and join this agency, and let’s work together, and I can teach you what you need to know about PR.’ So from there, I spent eleven years running PR agencies and running some large accounts focused on the technology sector. Then I had the opportunity to join Anthemis, so it is a little bit full circle because, I’m back in a marketing role. But it’s exciting to think that someone who has a bit more of a history on the communications and brand side is sitting where I sit. I know we’re going to talk a little bit about marketing vision and philosophy and approach… And I think that my love and my career focus on brand and story-telling and content and kind of the human side of marketing, even though I’ve been in some very quantitative environments too, really informs why I do what I do and why I stay in marketing. Ander: Awesome. And what do you do? Ander: Here at Anthemis you’re the CMO, so obviously you’re overseeing quite a few things going on. But what is Anthemis and what are you working on right now? Ander: Haha. ] I love that! At Anthemis we have three founders. They’re really mission-driven, and they’ve all worked in the financial services sector through their careers and have seen how broken it is, and they also know that there isn’t one way to fix what’s broken, and so that informs the way our business is organized. We are fairly well-known as early stage Fintech investors, and we’ve been doing that for almost a decade. We have more than fifty companies in our portfolio. Some of these companies were early stage at one time. Many of them, you know, we’ve grown as Anthemis with them. So companies like Betterment, Currencycloud, Trov, and others. We’re investors. We’re also advisors, so we have a whole consultancy part of our business where we help incumbents like big banks and insurance companies figure out how to make sense with the digital transformation that’s happening in financial services. And so we get to go into the hallowed halls of some of these large firms and help them figure out how to innovate. Often times it’s not about investing in X technology or implementing this solution. It’s all very people-focused. Ander: What’s an example of how it’s people-focused? Leslie: Well, we have this whole philosophy that the transformation that’s driving what’s happening in financial services is kind of operating on two axes, and one of those axes is all about organizational behaviors and the future of work. Ander: No, this is awesome. Continue! Leslie: Haha. But we are at the point now where the focus has to be on changing the behaviors in order to get people inside organizations to adapt to new ways of working with the technology now that it’s out there. Ander: That is all so, so cool. And, you know, there are benefits to working with huge companies, there are benefits to working with tiny little companies, and everything in between. And it sounds like you’re in a very unique position in that you have the opportunity to do just that. Leslie: Yeah, it puts us in a really cool spot. We talk a lot about the importance of the ecosystem and how we don’t believe in zero sum games. And what we see working with startups and also with incumbents is that we have to create a future where everyone can win. It’s not about startups taking down the banks or banks crushing the start-ups. I think we’re at a moment now in some ways where the financial services sector has caught up with Anthemis’ philosophy that we all need to work together and collaborate to win. You know, there may be short term wins, but we really focus on the medium and mostly on long term, and we see this transformation is really just starting, so we’re in it for the next ten years, twenty years, and beyond. Ander: Really, really cool. You mentioned with these large organizations, these incumbents as you refer to them, that a lot of it is about people, the adjustment from the industrial age to the information age. Ander: What’s one of the unique challenges that you see with smaller financial technology companies and how they’re breaking through the noise, how they’re getting their name and their brand and their product out there? Leslie: Gosh… I mean, in my career on the PR side, I’ve worked with so many different startup founders who were launching companies, many of them in the financial services sector too. I would say the advice that I would give an early stage startup founder who wants to get serious about PR and telling their message would be that many founders are very hesitant to talk about themselves. When you build something that you believe is awesome – a software product or technology – you want all the attention to be on that thing and not on you. But you need the PR to start, in many cases, before the product is actually fully baked, so I think it’s really important to be unafraid to create a personal profile for yourself as a founder and a founding team. We really like ‘founding teams’ at Anthemis. And also to stake out a clear vision of what’s happening in your industry and a sharp differentiated opinion about it, too, because it’s that sort of vision piece that can help you find, like… here come all the startup clichés – like, can create some runway for you from a communications perspective until you find your first clients, start to get some traction on the sales side. And then you can shift focus and have more of your marketing and communications focused on product. Ander: It sounds like what you’re saying is that, it’s really important to showcase the humans behind the company. Ander: I completely agree and that’s one of the reasons that I love podcasting is because it takes a voice and personifies a company. Webinars would do the same thing in a different way. And one of the things that I’ve seen and I’ve experienced as a consumer, as someone using a SaaS product or whatever, is it’s so easy to forget that there are humans behind this thing that you are using. There are humans that coded it, there are humans that did the marketing, that helped you discover it, you know? And it sounds like not enough companies are doing that, especially in the early stage. When that New York Times article or the TechCrunch article or the Search Engine Land article comes up, like, whatever your vertical is, telling the story of the people behind the business who created it and created the products, that’s incredibly compelling. And I don’t believe that that’s ever going to go away. Ander: I could not agree more. Now, PR is obviously something you’re passionate about and a focus of yours. What do you find to be the intersection between PR and specifically advertising? Where do you think that intersection is? Leslie: There’s lots of different ways to examine that intersection. The first thing that came to mind… Immediately prior to joining Anthemis, I spent some time at MSLGROUP which is basically Publicis’ big global PR agency, and there was an effort internally to basically create an AdTech software product to enhance earned media to give them further shelf life. So you could think of it almost as an in-house version of an Outbrain or a Taboola. Leslie: But because it’s a part of this sort of closed system, there’s some appeal there so that your PR clients for the first time wouldn’t have to go to their marketing ops team or their digital marketers inside their organization to be able to prove the value and to track that person from the earned media all the way back to point of sale or lead. That’s one way. So much of marketing these days is about attribution, and I get it, but it’s integrated too. In some ways, this goes back to the Anthemis philosophy about industrial age thinking about discrete units and measuring every discrete unit. Like, when you work for a PR firm, you know, you’re almost like a factory worker depending on the agency you work for in the sense that you measure your time in fifteen-minute increments. Leslie: And you actually plan out your and your team’s time to the minute for an entire month in advance in order to very tightly manage scopes of work and profitability and team resourcing and all of that. There is something inside marketing that also picks up this retro-industrial age paradigm where, yes, measure all the different things but measure the mix. Ander: Like the collective value? Leslie: Yeah. Measure the holistic impact. Perform experiments, you know, mix things up. But I just feel like there’s a real danger in creating these discrete bits artificially. Ander: Yeah, so here’s what I think is an example of that – and I’m just saying this to make sure I understand what you’re saying correctly… Right now, I work for a marketing technology company, and let’s say that Seth Godin, the world’s greatest marketer according to a number of people, takes a liking to Instapage and he makes a statement about it or writes a blog about it or whatever it might be… basically endorses the product. To be clear, this has not happened. Ander: I would love it to. Leslie: But Seth, if you’re out there… Haha. Ander: Yeah, yeah, yeah. But if he were to, or somebody else at his level, I feel like the value of that endorsement goes so far beyond the traffic that came from that blog post or any sort of attribution that comes from it. The qualitative value that you get from that is potentially so much more important. Leslie: Yeah, I mean, and then it goes to defining ‘what is attribution,’ right? Are you using ‘attribution’ synonymously with traffic that you drive to your website or some sort of action? What about all of the attribution that’s out there that hasn’t materialized yet, that’s sort of floating in the ether? Like, the person that did see that testimonial but hasn’t done anything yet, hasn’t signed up for anything. The PR industry for years, and they continue to, spend a lot of time and energy thinking about measurement and really sweating proving the value of PR to the organization. And so we look at things like share of voice, message pull-through, a lot of softer metrics that aren’t quite as… I don’t want to use the word ‘quantitative’ because they are quantitative but again, ‘measurement’ is tricky. I don’t know. I’m getting super ‘philosophy major’ right now. Haha. Ander: I love it. It’s awesome. Leslie: You’re talking about taking a thousand steps back because measurement is all in the eye of the beholder. Who are you paying to do your measurement? What does their measurement framework and paradigm look like? We live in an age where we already kind of know and accept – for better or worse – that when you look at a set of data you can make it say whatever you want, right? Leslie: So how much of marketing measurement and PR measurement is just us chasing our tail trying to save our asses and prove our value? Ander: Right. That’s a really, really interesting point and – this isn’t so much of a problem anymore because of all the third-party technologies out there and measurement tools, etc – but, you have to wonder if you’re paying an ad platform to run ads for you, they’re the ones who are very frequently providing you with the data on how effective those ads are and how they’re performing, etc. They’re the ones telling you and you’re paying them to get that information as well. Leslie: Yeah, I mean, you see it happening in the media space too, right? There’s now, over the last twenty-four months or so given what’s happening politically, people finally waking up to news origins, you know, media companies and where their news comes from and how news is created. I feel like there is some comfort probably in the ad and marketing measurement community. It’s like the old chestnut, ‘Oh, nobody ever got fired for hiring IBM.’ If you know that all of your competitors are using the same AdTech measurement platforms, there’s a certain level of comfort. Leslie: Like, you’re kind of all in the same game of ‘chicken.’ Haha. Leslie: So, yeah… I don’t know. It’s interesting to be chatting about this because the work that I do at Anthemis these days is really focused on brand content and thought leadership. We’re a professional services company, right? So our target audiences are really defined. And even though we have lots of different target audiences like start-ups, like investors in Anthemis, and also advisory clients, it’s a small universe, and we pretty much know who they are. So I’m thankful that I don’t work for a big consumer brand where I have to sweat this stuff on a day-to-day basis! Haha. Leslie: I’d have to surround myself with a great marketing ops team that could help me. Ander: Yup. Definitely understand that. Ander: So I really liked what you were talking about with the industrial age becoming the informational age. One of the questions that I like to ask in every single interview I do for this podcast is about where marketing is headed what is the future of marketing? And in that context, as we transition from the industrial age to the information age, where does marketing fit into that? How is marketing going to be affected by that? Leslie: It’s such an interesting parallel, and it’s not something that I’ve thought a lot about until we’re sitting here. Leslie: But as I think about it… So I’m just back from an annual retreat we run every year for the Anthemis ecosystem in France, so no complaints! Haha. Leslie: And it’s a series of loosely organized workshops where we take on some really big themes, so things like globalization and populism, climate and energy, workforce automation, you know, AI, machine learning. And we examine how all of these things may or may not impact financial services. One of the things that is… not new to this year’s retreat, but something we’ve been talking about a lot probably over the past several years is, what happens when the robots come for the menial jobs and technologies like blockchain also eliminate a lot of the back office stuff that hasn’t been automated yet but is soon to be automated? Leslie: Haha, yeah. Please do it so I can just come up with amazing campaign ideas, focus on networking, and meeting interesting people, and story-telling, and creating content. So if you love that side of marketing, I would hope that as marketers and technologists that that’s the future that we want to create for ourselves. Leslie: And I think, you know, we have a lot of specialists inside marketing that are all about helping you understand the spreadsheets, and other things like that. You know, I don’t mean to suggest that those people are going to, like, evaporate in the next decade. Leslie: Because I think it is a very human job to interpret data to turn it into insight and to figure out what it means. But if I were eighteen, and I’m thinking I want to have a career in marketing, I would focus on being smart, learning how to think, and learning how to write – those are skills that are never going to go out of style. I don’t know if this actually happens at universities but, like, don’t take a class on Salesforce! Haha. Leslie: Or Marketo, or any of those other technologies. Ander: Yeah, I mean, the bottom line is, yes, I agree. Definitely is not something you want to do. I mean, I don’t even have a degree in marketing and here I am. Leslie: Yeah, me neither. What’s your degree? Ander: My degree is in Broadcast and Electronic Communication Arts, so a lot of digital storytelling type stuff. Ander: And then I was in radio and then I went to internet radio and then I started marketing there and one thing led to another and here I am. So, yeah, I would totally agree with what you said. It’s really awesome to hear that validated as well. Leslie, we’re just about out of time and I know you’ve got a very busy schedule. I’ve got a couple more interviews I’m doing today. It’s actually nice that we’re having this conversation because one of the other interviews I’m doing while I’m in New York is VP of Marketing at Stash Invest. I don’t know if you’re familiar with them? Leslie: Um, no, but my friend who I was telling you about, Lindsay, who has the Spent podcast, I think she’s at Stash. Leslie: So try to bump into her. Ander: Yeah, I’m really looking forward to that. So, once again, thank you so much for taking the time to chat. Leslie: Oh we have to stop talking now?! Ander: Yeah, I wish we could keep on going! But yeah, this was awesome. Thanks for having me here and thanks for coming out. Leslie: Awesome. There’s one more thing I really want to say. Ander: I am so, so happy that you said that. Excellent advice. And I’m so happy that we get to end the conversation on that note. Wow, that was great. It was awesome being here and this was an awesome conversation. Thank you once again Leslie, and I’m sure we’ll talk to you soon.